Lunar New Year has traditionally been a time for people to return home and spend it with their families. And for those like Joyce Cheng (鄭欣宜), it is also a time to remember her mother. The legendary Lydia Shum (沈殿霞), Hong Kong’s cultural pride and happy fruit, passed away in 2008 after succumbing to her illnesses. She is survived by her daughter, Joyce, now a successful singer and actress in her own right. Lydia’s untimely death came as a shock to the world, but it was especially hard for Joyce, who grew up with her mother by her side. Lydia was Joyce’s world, and when Joyce made her decision of debuting in the entertainment industry, her mother was her biggest supporter. Joyce was born and grew up in Vancouver, Canada. Soon after her birth, her mother and her father, Adam Cheng (鄭少秋), divorced. While Adam remained in Hong Kong, Lydia stayed in Vancouver with Joyce. She was distant with her father, and it was only after Lydia’s death when Joyce and Adam decided to “break the ice” of their relationship. Without her closest family by her side, Joyce chose to spend her Lunar New Year this year by watching old films starring her late mother. 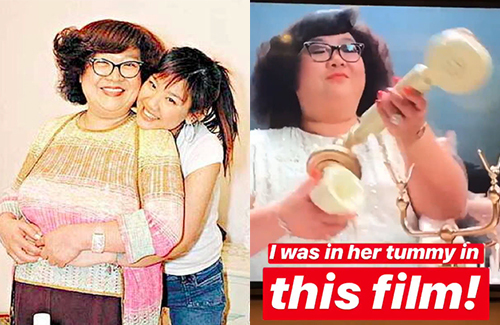 In a series of Instagram stories, Joyce told her followers that she had been watching her mother’s 1987 film It’s a Mad, Mad, Mad World <富貴逼人>.